In this post, I include two Miocene species of Turritella whose geologic ages overlap. This overlap is called a "concurrent-range zone," and I shall illustrate this topic more in a later post. Both species of these turritellas are common in southern California and can occur together in the same deposit. This is result of two separate evolutionary lineages of Turritella co-existing at the same time. AGE RANGE: Cenozoic (early to middle Miocene = 23 to about 14 million years ago). REMARKS: This species can show much variation. 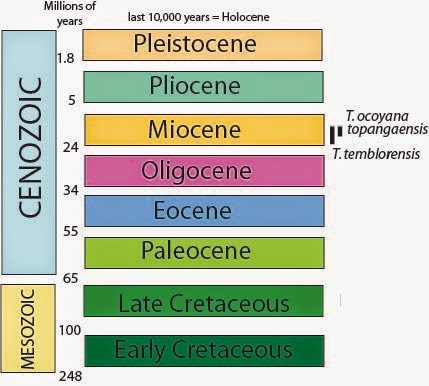 AGE RANGE: Cenozoic (middle Miocene = about 14 million years ago). GEOGRAPHIC RANGE: Central and southern California.